Peripheral neuropathy (PN) is a common disorder and presents as diagnostic and therapeutic challenge to physicians and neurologists. In epidemiological studies from India from various regions the overall prevalence of PN varied from 5 to 2400 per 10,000 population in various community studies. India is composed of a multiethnic, multicultural population who are exposed to different adverse environmental factors such as arsenic and lead. Use of different chemotherapeutic agents with propensity to affect peripheral nerves, increasing methods of diagnosis of connective tissue disorders and use of immunomodulating drugs, growing aging population is expected to change the spectrum and burden of peripheral neuropathy in the community. The other important aspect of peripheral neuropathies is in terms of the geographical and occupational distribution especially of toxic neuropathies like arsenic which is common in eastern belt; lead, mercury and organo-phosphorous compounds where occupational exposures are major sources. Inflammatory neuropathies either due to vasculitis or G B Syndrome, chronic inflammatory polyradiculopathies are another major group of neuropathies which is increasing due to increase longevity of Indian subjects and immunological impairment, also adds to morbidity of the patients and are potentially treatable. Leprous neuropathy is common in India and although its frequency is significantly decreasing because of national control program yet pure neuritic form still remains a cause of concern and similar is the case with another infective cause like diptheric neurpathy. Thus this article is an attempt to cover major categories and also highlight the areas where further studies are needed. Levodopa – the aromatic amino acid L-3,4–dihydroxy phenylalanine has held the attention of neurologists and pharmacologists alike for more than half a century. Even though extensive research has been done across the globe in treatment of Parkinson's disease, with different molecules, none could replace the gold standard treatment or provide complete relief for the debilitated. Although research brought us better tips and tricks to modulate the dopamine blood levels to balance between the desired and deleterious effects, it could never replace the basic substrate. From simple oral preparation to more advanced treatment like duodenal dopa administration for better efficacy and compliance, L-dopa has sure undergone scrutiny and stayed strong as the fundamental neurotransmitter replacement therapy to pave path for many more new therapeutic strategies. So as a token of gratitude to the revolutionary agent and pioneers behind it, a trip down the memory lane is in order. Levodopa-induced dyskinesia (LID) is commonly seen in Parkinson's disease patients treated with levodopa. This side effect is usually encountered after long duration of treatment, but occasionally, this may be seen even after few days or months of treatment. LID is broadly classified as peak-dose dyskinesia, wearing-off or off-period dyskinesia, and diphasic dyskinesia. Pathogenesis of LID is complex, and different neurotransmitters such as dopamine, glutamine, adenosine, and gamma-aminobutyric acid play important role altering the normal physiology of direct and indirect pathway of cortico-basal ganglia-thalamic loop responsible for fine motor control. Treatment of LID requires careful history taking and clinical examination to find the type of dyskinesia as different approach is required for different types. Changes in dopaminergic medication including continuous dopaminergic stimulation are very helpful in the management of peak-dose dyskinesia. Different types of surgical approaches including unilateral pallidotomy and deep brain stimulation have given very good result in patients, who cannot be managed by medications alone. The surgical management of LID is dealt with in detail in another review in this series. 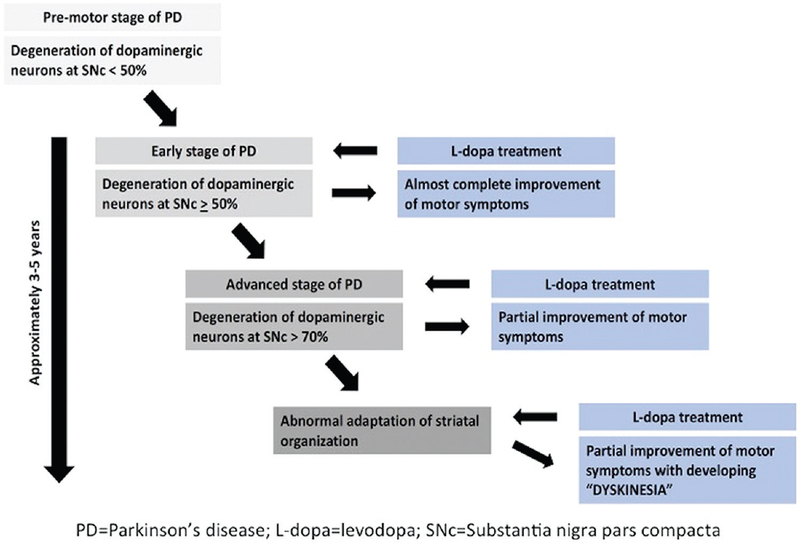 The treatment of motor manifestations of Parkinson's disease (PD) is essentially a trade-off between adequate relief of motor symptoms and prevention and control of motor complications, particularly levodopa-induced dyskinesia (LID). Progression of PD is paralleled by a progressive difficulty in achieving the balance. Functional neurosurgical procedures provide sustained relief of LID in carefully selected patients when further tailoring of medical therapy fails to achieve this goal. Though deep brain stimulation (DBS) has superseded lesioning surgeries, pallidotomy still has a role in those patients in whom DBS is not feasible for financial or other reasons. James Papez worked on the anatomical substrates of emotion and described a circuit, mainly composed of the hippocampus, thalamus and cingulum, and published his observations in 1937. However, such an idea existed before him, as evidenced by the rudimentary indications from Paul Broca, and Paul MacLean added some other structures like, septum, amygdala, and hypothalamus in its ambit and called it the limbic system. Paul Ivan Yakovlev, proposed a circuit which also referred to orbitofrontal, insular, anterior temporal lobe, and other nuclei of thalamus. Further works hinted at cerebellar projections into this system and the clinical picture of aggression, arousal and positive feeding responses with stimulation of cerebellar nuclei, attests its possible role. Finally, the work of Heinrich Klüver and Paul Bucy of the United States of America on ablating the temporal lobes and amygdala and the resultant behaviour of the animals, almost incontrovertibly adduced evidence for the operation of a neural circuitry in the genesis of emotion. 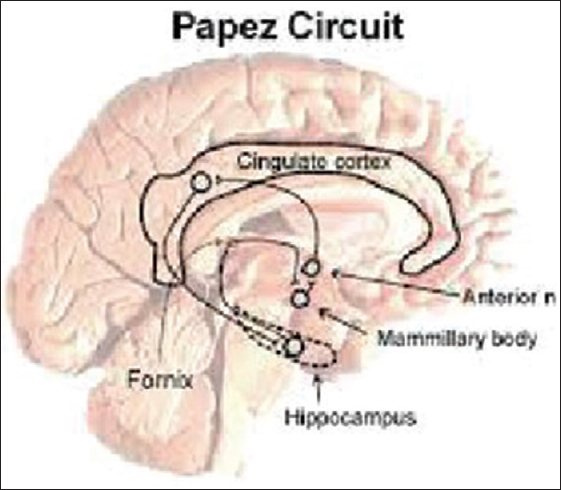 Additionally, Papez circuit may also be concerned with memory and damage to its various components in Parkinson's disease, Alzheimer's disease, Korsakoff's syndrome, semantic dementia, and global amnesia, where cognitive disturbance is almost universal, lends credence to its putative role. 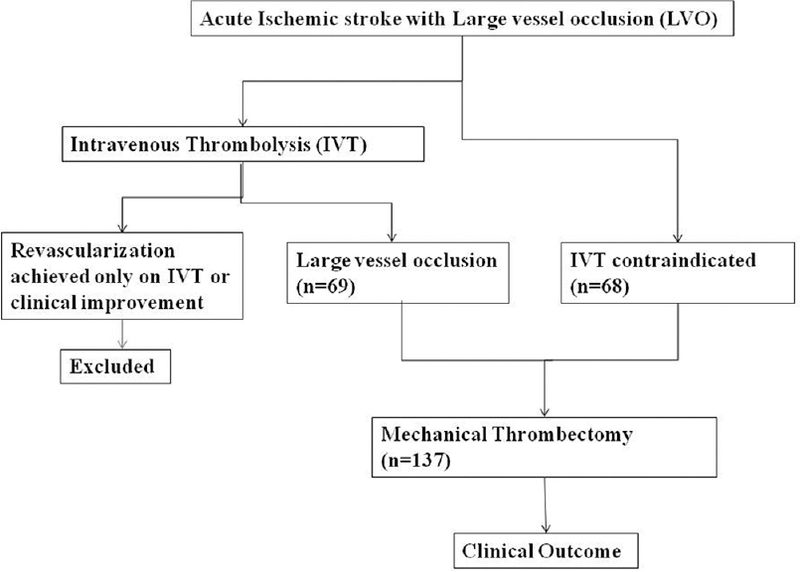 Background: Mechanical thrombectomy (MT) is the most effective treatment in large vessel occlusion (LVO). We have analyzed our initial experience of MT of 137 patients in anterior circulation (AC) and posterior circulation (PC) LVO using Solitaire stent retriever device. Methods: Retrospective cohort analysis of 112 AC and 25 PC acute ischemic strokes was done considering various baseline characteristics, risk factors, National Institute of Health Stroke Scale (NIHSS) change, revascularization rate, complications, and functional outcome at 3 months using modified Rankin score. Results: Out of 137 patients, occlusion was found in M1 segment (44.5%), carotid T occlusion (37.2%), and basilar artery (18.2%). Atrial fibrillation was important risk factor for Carotid T occlusion. 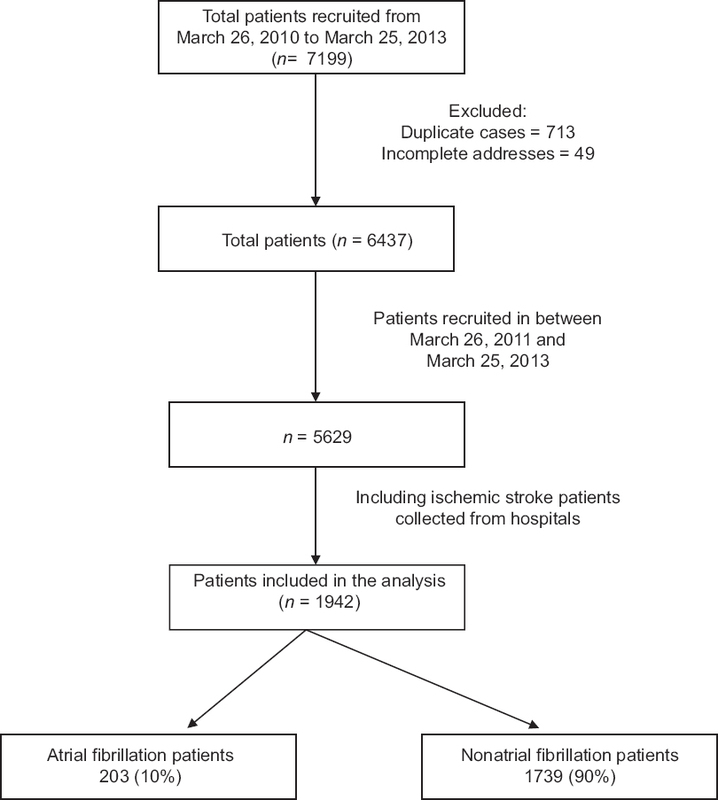 50.4% patients received intravenous thrombolysis. Baseline mean NIHSS in AC was 15.5 (±4.32), and PC was 19 (±5.5). Tandem lesions were noted in 14.6%. There was significant difference in mean door-to-needle time for AC and PC (220 ± 80.6 and 326 ± 191.8 min, respectively). Mean time to revascularization for AC (39.5 ± 14.1) and PC (42.2 ± 19.4) was similar. Procedural success (modified thrombolysis in cerebral infarction ≥2b) observed in AC and PC was 92.9% and 84%, respectively (P = 0.154). NIHSS at admission between 5 and 15 and immediate postprocedure NIHSS improvement >4 was associated with significant better clinical outcome at 3 months. Overall complication rate was about 15.3% including symptomatic intracranial hemorrhage in 8.1% and 6.6% deaths. Conclusion: MT is safe treatment and equally effective for both AC and PC LVO. With careful patient selection, clinical outcome in PC was comparable to AC despite delayed presentation and higher baseline NIHSS. Background: Brain damage can impair the use of all languages in bilingual persons. For effective management of aphasia (i.e., impaired language) in such persons, assessment of all languages is essential. The most widely used test for this purpose – the Bilingual Aphasia Test (BAT) – is cumbersome and requires a considerable amount of time for administration. To overcome this limitation, a short version of the BAT has been recommended. Objective: The objective of this study was to derive a short version of BAT for Malayalam-English bilingual persons with aphasia and to establish the test–retest reliability as well as the content and construct validities of this version. Methods: Following the recommendations of the test developers, we used seven subtests from the draft of an adapted full version of Malayalam BAT. These subtests in Malayalam and their counterparts in English were administered on a group of 22 Malayalam-English bilingual participants with aphasia. The scores obtained from these two languages were used to establish content and construct validities of the short version of the BAT in Malayalam. Further, we readministered the short version of BAT in a group of ten participants with aphasia to examine the test–retest reliability within 14 days from the date of first administration. Results: The short version of BAT in Malayalam revealed high test–retest reliability as well as content and construct validities. The administration time ranged between 30 and 45 min. Conclusions: Thus, the short version of the BAT in Malayalam can be considered a valid and reliable language test that can be quickly administered in Malayalam-English bilingual persons with aphasia. Background: Idiopathic intracranial hypertension (IIH) is increased intracranial pressure (ICP) with normal cerebrospinal fluid (CSF) contents, in the absence of an intracranial mass, hydrocephalus, or other identifiable causes. The current knowledge of the treatment outcome of IIH is limited, and the data on the natural history of this entity are scant. Objective: The objective of the study is to study the treatment response of IIH by serially measuring the CSF opening pressure and to delineate the factors influencing the same. Materials and Methods: A prospective observational study in a cohort of fifty patients with IIH in whom CSF opening pressure was serially measured at pre-specified intervals. Results: The mean CSF opening pressure at baseline was 302.4 ± 51.69 mm of H2O (range: 220–410). Even though a higher body mass index (BMI) showed a trend toward a higher CSF opening pressure, the association was not significant (P = 0.168). However, the age of the patient had a significant negative correlation with the CSF pressure (P = 0.006). The maximum reduction in CSF pressure occurred in the first 3 months of treatment, and thereafter it plateaued. Remission was attained in 12 (24%) patients. BMI had the strongest association with remission (P = 0.001). Conclusions: In patients with IIH, treatment response is strongly related to BMI. However, patients with normal BMI are also shown to relapse and hence should have continuous, long-term follow-up. 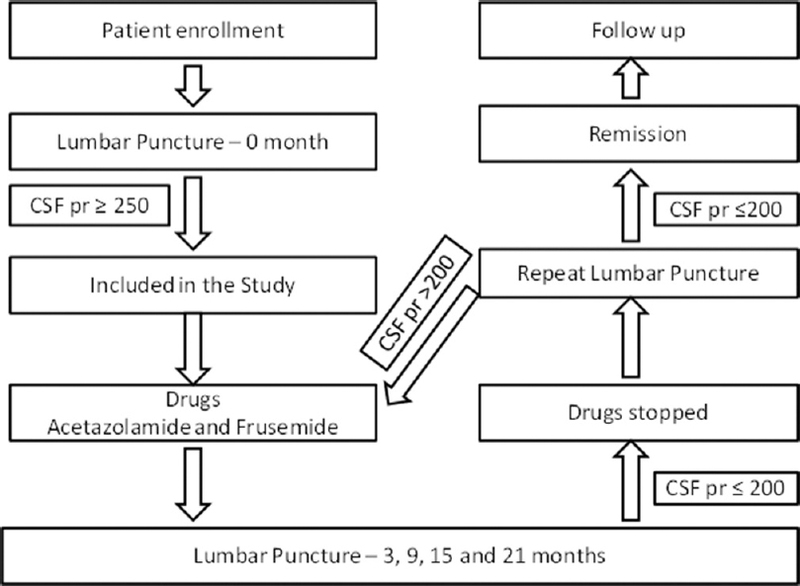 The reduction in CSF pressure attained in the first 3 months could reflect the long-term response to treatment. Background: Cryptococcal meningitis is an important and a fatal neuroinfection. Early diagnosis and treatment is of utmost importance in reducing morbidity and mortality. Materials and Methods: Data of patients with laboratory-confirmed cryptococcal meningitis seen in tertiary care hospital were reviewed. Details of demographic profile, clinical data, laboratory parameters, complications, and in-hospital mortality were studied. Results: Among 97 patients with cryptococcal meningitis (79 men, 18 women), 88 were HIV-positive, two were diabetic, and seven were sporadic. Their age ranged from 23 to 67 years (39.16 ± 9.49). Additional pathogens for meningitis were identified in 24 patients. Headache was the most common symptom (91%) followed by fever (66%), vomiting (51%), altered sensorium (31%), and seizures (20%). Neurological deficits included cranial nerve palsies (28), motor deficits (11), sphincter disturbances (5), and sensory involvement in four patients. Complications included renal dysfunction (20%), dyselectrolytemia (20%), seizures (16%), hypersensitivity (7%), and hepatic dysfunction (5%). Favorable outcome was seen in 72 patients, 13 remained unchanged, and 12 died. Rapid clinical progression, low cerebrospinal fluid (CSF) cell count and protein were associated with higher mortality. CSF cell count and protein were lower in patients who had isolated cryptococcal meningitis compared to those with additional pathogen. Mean sugar levels were higher and duration of illness was shorter in HIV-negative individuals. Conclusion: Cryptococcal meningitis is common in patients with AIDS. Effective and early antifungal treatment carries a good prognosis. On rapid evolution of the disease, decreased CSF cell count and protein heralds poor prognosis and warrants initiation of early specific treatment. Background: Neuromyelitis optica (NMO) is an inflammatory demyelinating central nervous system disease, with recurrent attacks of severe bilateral optic neuritis and longitudinally extensive transverse myelitis. Aggressive immunosuppression is essential to prevent clinical relapses and permanent disability. Rituximab, a monoclonal antibody to CD20, has been found effective in several reports and small uncontrolled studies. There is a paucity of data regarding its use in Indian patients. Objectives: The aim of this study was to report the results of rituximab treatment in NMO spectrum disorders (NMOSDs) in the Indian scenario. Methods: This study is a retrospective, observational study including 13 NMOSD patients treated with rituximab. After initial therapy in the acute episode with IV methylprednisolone and if needed plasma exchange, therapy was initiated as a cycle of intravenous rituximab, two doses 2 weeks apart of 1 g each. Subsequent cycles were advised at intervals of every 6 months. The primary outcome measure was annualized relapse rate (ARR), defined as a number of clinical attacks per year. Clinical adverse events were recorded throughout the study. Results: In the study, mean ARR reduced from 2.61 to 0.09 after therapy (P = 0.000685). Of 13 patients, 8 (61.54%) were completely relapse free after starting treatment with rituximab. Treatment was well tolerated and no serious adverse events were noted. Conclusions: The treatment of NMOSDs with rituximab in Indian patients reduces the frequency of relapses and is well tolerated. Background: Apart from unpredictable seizures and consequent injuries, people with epilepsy (PWE) confront with psychosocial adjustments. Quality of life (QOL) varies with culture and socioeconomic milieu. Identification of predictors for QOL enables comprehensive and effective care. Objective: The objective of this study was to investigate the role of stigma, demographic, socioeconomic, and clinical factors in QOL among PWE. Subjects and Methods: In this prospective observational study, 170 PWE answered QOL in epilepsy-31 (QOLIE-31) and stigma questionnaire. Internal consistency of instruments was evaluated by Cronbach's alpha and reproducibility by intracorrelation coefficient (ICC). Descriptive statistics were calculated, and predictors were identified by regression analysis. Results: Mean age of the PWE was 34.39 ± 11.49. Cronbach's alpha and ICC of the QOLIE-31 were 0.946 and 0.974 and stigma scale was 0.903 and 0.954, respectively. Mean total QOL was 60.29 ± 14.12. Highest and lowest scores of subscales of QOL were observed in medication effects and social functioning. Mean stigma score of PWE was 22.21 ± 14.64. Majority of PWE had mild stigma (75%) followed by moderate (22%) and high stigma (1%). Stigma score correlated with total and subscales of QOL (P < 0.01). Statistically significant decrease in scores of total and subscales of QOL was observed in high and moderate stigma when compared to mild stigma (P < 0.01). Stigma (standardized beta coefficient = −0.652, P< 0.00) and polytherapy (standardized beta coefficient = −0.180, P< 0.02) were found to be the significant predictors of QOL. Significant decrease in total and subscale scores of QOL was observed in PWE under polytherapy when compared to monotherapy and also in seizure frequent against seizure-free PWE (P < 0.01). Conclusions: Besides control of seizures, encouragement of monotherapy and destigmatization campaigns may improve the QOL of PWE. Background: Abnormal carotid intima-media thickness (IMT) is a marker of carotid atherosclerosis which is a risk factor for cerebrovascular and cardiovascular diseases. Recent studies have found an association of 25-hydroxyvitamin D deficiency with abnormal carotid IMT. Purpose: The purpose of the study was to investigate the association of serum 25-hydroxyvitamin D levels with carotid IMT in Indian participants. Materials and Methods: We prospectively recruited 300 participants at Yashoda Hospital, Hyderabad, during the study period between January 2012 and December 2014. All participants were assessed for fasting blood sugar, lipid profile, C-reactive protein (CRP), serum alkaline phosphatase, serum calcium, serum phosphorous, serum 25-hydroxyvitamin D levels, and carotid Doppler examination. Results: Among the 300 participants, men were 190 (63.3%) and mean age was 51.9 ± 7.7 years with a range from 35 to 64 years. On risk factors evaluation, 105 (35%) were hypertensive, 79 (26.3%) diabetics, 63 (21%) smokers, and 56 (18.6%) were alcoholics. On evaluation of biochemical parameters, 81 (27%) had dyslipidemia, 120 (40%) had elevated CRP levels, 119 (39.6%) had 25-hydroxyvitamin D deficiency, mean alkaline phosphatase was 93.9 ± 14.9 IU/L, serum calcium (mg/dL) was 9.2 ± 2.3, and serum phosphorous 4.4 ± 1.2 mg/dL. 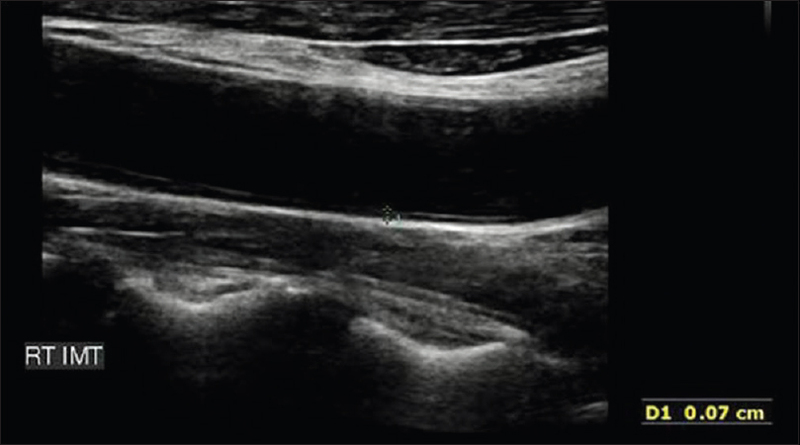 On carotid imaging, 121 (40.3%) had abnormal IMT. After multivariate analysis, 25-hydroxyvitamin D deficiency (odds ratio [OR]: 2.14; 95% confidence interval [CI]: 1.29–3.55), dyslipidemia (OR: 2.53; 95% CI: 1.46–4.40), elevated CRP (OR: 2.27; 95% CI: 1.37–3.76), smoking (OR: 2.09; 95% CI: 1.16–3.77), and diabetes (OR: 1.84; 95% CI: 1.05–3.21) were independently associated with abnormal IMT. Conclusion: In our study, we established 25-hydroxyvitamin D deficiency as an independently associated with abnormal IMT in Indian participants. Introduction: Orthostatic hypotension is defined as a sustained decrease in systolic blood pressure of 20 mm Hg or a decrease in diastolic blood pressure of 10 mm Hg within three minutes of standing compared with blood pressure from the sitting or supine position or by head-up tilt-table testing (1). When sustained blood pressure (BP) drop is after three minutes of upright posture it is called delayed orthostatic hypotension (delayed OH) (2). Aim of the Study: To detect the incidence of delayed orthostatic hypotension in patients referred to our autonomic lab. Materials and Method: BP was measured noninvasively at 1-minute intervals with an automated cuff sphygmomanometer over the right brachial artery for 45 minutes. The onset and duration of falls in blood pressure either systolic or diastolic or both were documented, and any associated symptoms were recorded. Only patients with sustained falls in BP were included. Drugs causing OH was stopped 48 hours before testing as per protocol followed in lab. We also looked into other autonomic function test abnormalities in patients with delayed OH. Inclusion criteria: Patients above age of 18 years referred for evaluation of autonomic function tests. Exclusion criteria: Patients with severe cardiac failure and cardiac arrhythmias were excluded and patients with rapid fall in BP and bradycardia (Neurally mediated syncope) were excluded. Results: Total 170 patients underwent tilt table testing. Orthostatic hypotension was seen within 3 minutes in seventy patients, fifty patients had delayed OH (BP fall after 3 minutes). There were twenty seven males and twenty three females in this group. Twenty nine of the 50 patients with delayed orthostatic hypotension, had symptoms during the tilt table procedure. Asymptomatic OH was more common in patients who developed OH after 10 minutes. Conclusion: This is a pilot study, first in India where we looked into the incidence of delayed orthostatic hypotension in patients undergoing tilt table testing in our autonomic lab. We found that fifty patients had delayed orthostatic hypotension which could have been missed on clinical evaluation. High clinical suspicion is needed to detect this disorder and tilt table testing should be done in suspicious cases since orthostatic hypotension is cause of high morbidity. Background: Trans Cranial Colour Doppler (TCCD) has been extensively used in various neurological and neurosurgical conditions causing severe raise in the intracranial pressure (ICP). Material and Method: Our study explores the sequential evolution of TCCD flow pattern by correlating with pupillary reactivity, Glasgow coma scale (GCS), and imaging. Our cohort consisted of thirty patients with ten patients in each subgroup admitted to the neuro-Intensive Care Unit (NICU) for various neurological and neurosurgical causes. Middle cerebral artery was insonated through the transtemporal window at the time of admission to NICU. 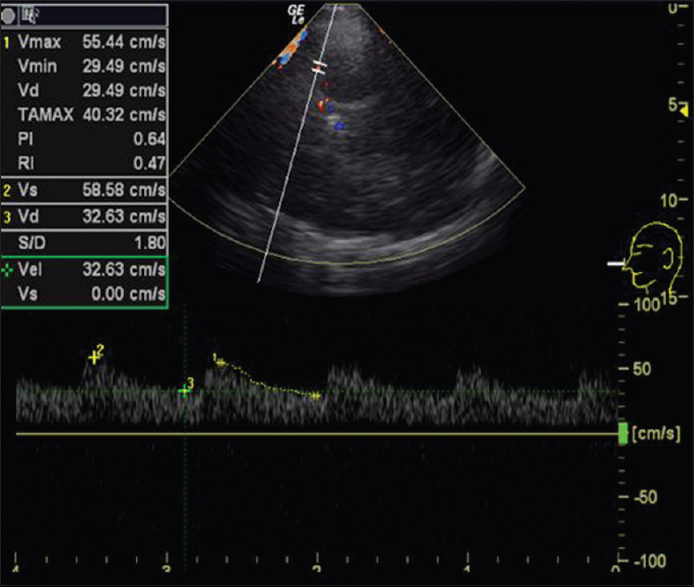 Doppler waveform and parameters such as peak systolic velocity, end-diastolic velocity, systolic by diastolic ratio, pulsatility index, and resistivity index were recorded. The clinical variables for evaluating the degree of raised ICP were the GCS and pupil size. Other systemic parameters such as mean arterial pressure, heart rate, and respiratory rate were also considered and these results were further correlated with TCCD findings. The groups were divided into three groups based on GCS, pupillary reactivity, and imaging. Imaging was done to indicate the etiology for ICP changes and also to look for signs of raised ICP. 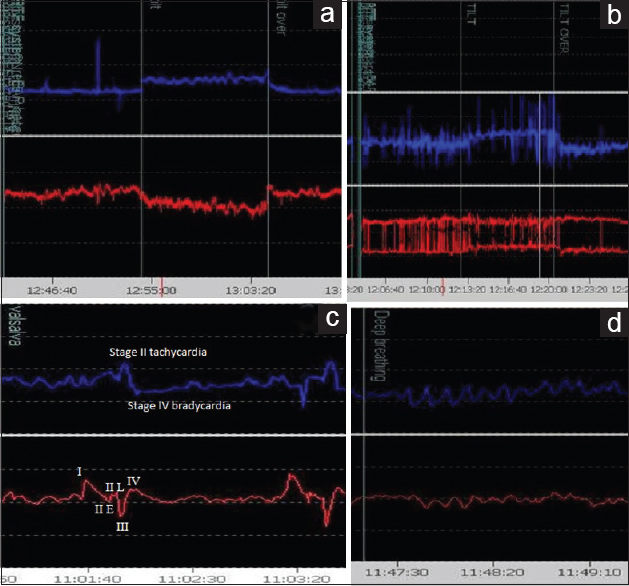 Results: Ten distinct types of waveform patterns were noted, and these waveforms correlated with various physiological parameters suggestive of raised ICP. Conclusion: The sequential evolution of distinct patterns of Doppler waveform with increasing degree of raise in ICP has been described and can act as a quick screening tool in NICU and helps stratify patients for treatment and prognostication. Introduction: Acute intermittent porphyria (AIP) is an inherited metabolic disease characterized by disordered heme biosynthesis. There is no recent study reported from India. Materials and Methods: It was a retrospective, observational study. Clinical records of patients of AIP with acute porphyric attacks admitted from April 2008 to December 2016 were analyzed. Results: Fifteen AIP patients constituted of eight females and seven males were analyzed. Mean age at presentation was 34.33 ± 15.86 years. Thirteen patients (86.67%) had acute flaccid paralysis (AFP). All of them had peripheral neuropathy. These patients concomitantly had abdominal pain, seizure, encephalopathy, autonomic hyperactivity, history of passage of dark urine, and electrolyte abnormality (hyponatremia) in various combinations. Abdominal pain was the presenting symptom in 11 (73.33%) patients. Seven (46.67%) patients had seizure episodes. Five patients (33.33%) had hyponatremia at presentation. Significantly higher percentage of them had seizure at presentation or during hospital stay (P = 0.007). These patients also had evidence of autonomic hyperactivity in the form of higher pulse rate, systolic and diastolic blood pressure at presentation. They had prolonged duration of hospital stay as well (P = 0.016). Eleven patients had partial recovery and rest four patients (26.67%) had in-hospital mortality. Conclusion: Patients had severe neurological involvement manifesting mainly as AFP and seizure episodes. We recommend screening for AIP in patients presenting with features of AFP along with any combination of clinical/laboratory manifestations such as abdominal pain, seizure, encephalopathy, autonomic hyperactivity, passage of dark urine, and hyponatremia. Electrolyte abnormality in the form of hyponatremia was an important severity marker. Objective: Frontal executive dysfunction (FED) and abnormalities in volumetric magnetic resonance imaging (MRI) have been described in juvenile myoclonic epilepsy (JME). We aimed to compare JME patients with and without FED by group analysis of voxel-based morphometric (VBM) estimates of brain volume in MRI. Subjects and Methods: We studied frontal executive functions in patients with JME and analyzed the possible association of FED with their demographic, clinical, and electrographic characteristics. We aimed to do group analysis of the VBM MRI brain data to compare the gray matter (GM) volumes of JME patients with and without FED. Results: We recruited 34 patients (20 women) with JME (mean age 23.7 ± 4.58 years) from the epilepsy outpatient services. FED was detected in twenty patients (58.8%). 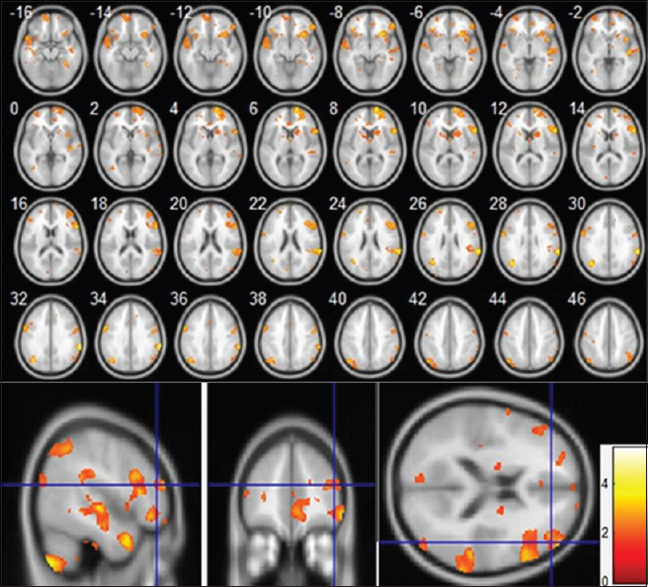 Group analysis of VBM MRI brain showed significant (P < 0.001) reduction in GM volume in dorsolateral prefrontal cortex (left Brodmann area [BA] 10, 46, 9, Z-score 3.36, 2.91, 2.03, respectively, and right BA 10 and BA 45, Z-score 2.98 and 3.36, respectively), left insula (BA 13, Z-score 2.14), temporal lobe (BA 38, Z-score 2.76), in the subgroup of JME with FED. Inference: JME with FED has an anatomical correlate in the form of reduced GM volume in dorsolateral prefrontal cortex. Introduction: In chronic inflammatory demyelinating polyneuropathy (CIDP), emphasis has been on motor disabilities, and autonomic dysfunction in these patients has not been addressed systematically. Materials and Methods: Autonomic function was prospectively analyzed in 38 patients with CIDP. Quantitative autonomic function testing was done using Finometer® PRO and severity of adrenergic and cardiovagal dysfunction graded according to composite autonomic severity score and sudomotor dysfunction assessed using sympathetic skin response. Results: Thirty-four (89%) patients had features of autonomic dysfunction. Thirty-three (86%) patients had cardiovagal dysfunction, 21 (55%) had adrenergic dysfunction, and 24 (63%) had sudomotor dysfunction. Autonomic dysfunction was mild to moderate in the majority (86%). Conclusions: Autonomic dysfunction in CIDP is underreported and potentially amenable to therapy. Our cohort had a high proportion of adrenergic dysfunction compared to previous studies. Objectives: There are limited data regarding long-term follow-up and therapeutic outcomes in Sjogren's syndrome (SS)-associated peripheral neuropathy. In this study, we aim to study the clinical, electrophysiological spectrum and therapeutic responses among the different subtypes of SS-associated neuropathy. The predictors of suboptimal treatment response will be identified. Methods: The study included a retrospective cohort of patients with SS-associated neuropathy between January 2012 and November 2015. Baseline clinical, laboratory, electrophysiological data and details of treatment were noted. Therapeutic outcomes were assessed at follow-up and compared among the different subtypes. Prognostic predictors were determined using logistic regression analysis. Results: Fifty-four patients were included in the study. Sensory ataxic neuropathy (17, including 9 with sensory ganglionopathy) and radiculoneuropathy (11) were the main subtypes. Notable atypical presentations included acute neuropathies, pure motor neuropathies, and hypertrophic neuropathy. Concomitant autoimmune disorders were present in 24 (44.4%) patients. Most presentations were subacute-chronic (51, 94.4%). Minor salivary gland biopsy had a higher yield compared to serological markers (81.5 vs. 44.4%). Sensory ataxic neuropathy was associated with greater severity and autonomic dysfunction. Improvement was noted in 33 (61%) patients. Cranial neuropathy and radiculoneuropathy subtypes were associated with the best treatment responses. Chronicity, orthostatic hypotension, baseline severity, and marked axonopathy (nerve biopsy) were predictive of a suboptimal therapeutic response. Conclusions: The study highlights the heterogeneous spectrum, atypical presentations, and differential therapeutic responses. SS-associated neuropathy remains underdiagnosed. Early diagnosis and prompt initiation of immunotherapy before worsening axonal degeneration is paramount. SS-associated neuropathy need not necessarily be associated with a poor prognosis. Background: Factor V Leiden is the most common genetic variation among the blood coagulation pathway which leads to prothrombotic state, therefore, is considered an important gene for understating the stroke mechanism. Aim: The aim of the present study is to determine the relationship between single nucleotide polymorphism at G1691A position of Factor V gene and risk of ischemic stroke (IS) in North Indian population. 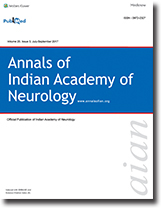 Materials and Methods: In a retrospective case–control study, 250 patients with IS and 250 age- and gender-matched controls were enrolled in the period of October 2012 to September 2014 from in- and out-patient department of Neurology, All India Institute of Medical Sciences, New Delhi, India. 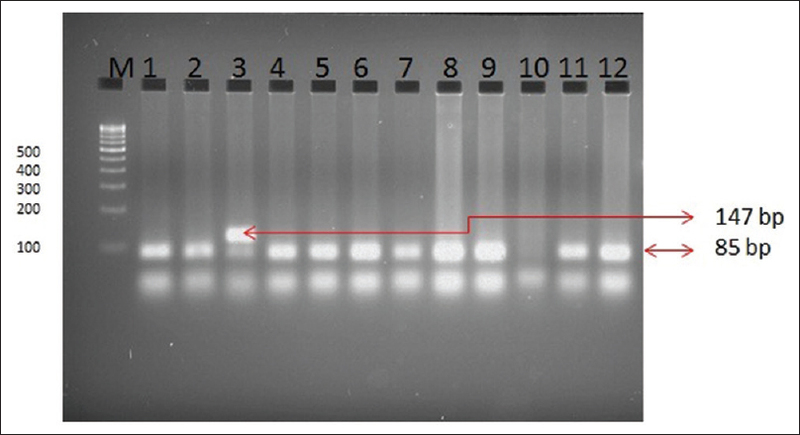 Deoxyribonucleic acid for each case and control was isolated from peripheral blood using phenol-chloroform extraction method. Polymerase chain reaction-restriction fragment length polymorphism method was used to determine the polymorphism. Data were analyzed using STATA Software Version 13. Results: The mean age of IS patient was 52.8 ± 12.5 years and in control group was 50.97 ± 12.7 years. Genotypic frequency distributions were in accordance with Hardy–Weinberg equilibrium in both cases and controls. As expected hypertension, diabetes, dyslipidemia, smoking, heavy alcohol intake, family history of stroke, and poor economic status were significantly associated with the risk of IS. Multivariate analysis revealed 5.17 times higher odds for developing the risk of large vessel subtype of IS in patients carrying Factor V Leiden G1691A gene variation as compared to control subjects (OR, 5.17; 95% CI, 1.32–20.3, P= 0.01). Conclusion: The present study suggests that Factor V Leiden G1691A polymorphism may be significantly associated with the risk of large vessel subtype of IS. Large sample size studies using prospective cohort designs are required to corroborate the present findings. Objectives: Atrial fibrillation (AF) is the most common sustained cardiac rhythm disorder associated with stroke. This study was done to describe risk factors, clinical features, and short-term outcomes of stroke patients with AF. Materials and Methods: This study was a part of the Indian Council of Medical Research funded “Ludhiana urban population based Stroke Registry.” Data were collected using WHO STEPS stroke method. All patients ≥18 years of age, who developed ischemic stroke between March 26, 2011, and March 25, 2013, were included in this study. Data about demographic details, clinical features, and risk factors were collected. The outcome was assessed at 28 days using modified Rankin scale (mRs) (good outcome: mRS ≤2; poor outcome >2). The statistical measures calculated were descriptive statistics, Chi-square test, Fischer's exact test, and independent t-test. Results: Of the total 7199 patients enrolled in the registry, data of 1942 patients who fulfilled inclusion criteria were analyzed, and AF was seen in 203 (10%) patients. AF patients were older (AF 62 ± 14 vs. non-AF 60 ± 15 years, P= 0.01), had more hypertension (AF 176 [87%] vs. non-AF 1396 [80%], P= 0.03), hyperlipidemia (AF 60 [32%] vs. non-AF 345 [21%], P= 0.001), coronary artery disease (AF 60 [30%] vs. non-AF 195 [11%], P< 0.0001), and carotid stenosis (AF 14 [7%] vs. non-AF 57 (3%), P= 0.02). They had worse outcome (mRS >2; AF 90 [50%] vs. non-AF 555 [37%], P= 0.001). Conclusions: Ten percent of stroke patients had AF. They were older, had multiple risk factors and worse outcome. There was no gender difference in this large cohort. Visual impairment can complicate cerebral venous thrombosis (CVT). Here, we describe the various pathophysiological mechanisms and treatments available. A retrospective chart review of all patients treated for CVT in a large quaternary teaching hospital was done, and cases with visual impairment due to CVT were identified. 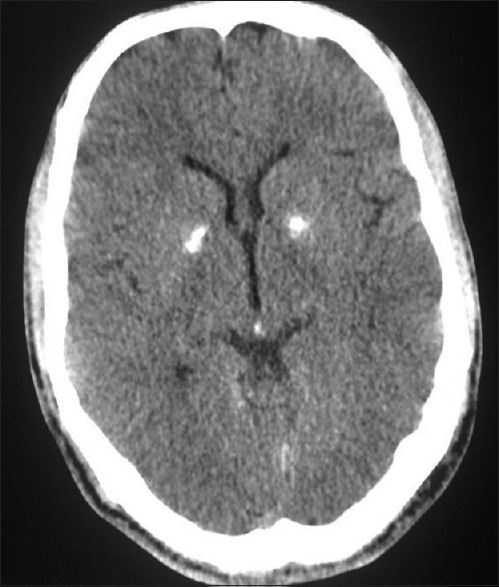 The various mechanisms causing visual impairment in CVT were (1) raised intracranial pressure (ICP) caused by venous thrombosis without venous infarcts resulting in a benign intracranial hypertension-like presentation of CVT, (2) venous infarcts involving the occipital cortex, (3) raised ICP following the development of a secondary dural arteriovenous (AV) fistula, and (4) arterial occipital infarcts due to posterior cerebral artery compression secondary to herniation in large venous infarcts. Apart from using systemic anticoagulants to attempt recanalization and drugs with carbonic anhydrase inhibitor activity to reduce the ICPs, treatment modalities employed to save vision were (1) recanalization by local thrombolysis, stenting, or mechanical devices; (2) cerebrospinal fluid diversion procedures such as theco-periotoneal shunting; (3) optic nerve sheath fenestration; and (4) specific treatment for conditions such as dural AV fistula occurring as a late complication. CVT can cause visual impairment through different pathophysiological mechanisms. Depending on the mechanism, treatment strategies need to be tailored. Furthermore, very close monitoring is needed both in the acute and in the follow-up period, as new pathophysiological mechanisms can arise, compromising the vision. This may require a different treatment approach. Literature on this aspect of CVT is lacking. Background: Limb-girdle muscular dystrophy (LGMD) is the most common adult-onset class of muscular dystrophies in India, but a majority of suspected LGMDs in India remain unclassified to the genetic subtype level. The next-generation sequencing (NGS)-based approaches have allowed molecular characterization and subtype diagnosis in a majority of these patients in India. Materials and Methods: (I) To select probable dysferlinopathy (LGMD2B) cases from other LGMD subtypes using two screening methods (i) to determine the status of dysferlin protein expression in blood (peripheral blood mononuclear cell) by monocyte assay (ii) using a predictive algorithm called automated LGMD diagnostic assistant (ALDA) to obtain possible LGMD subtypes based on clinical symptoms. (II) Identification of gene pathogenic variants by NGS for 34 genes associated with LGMD or LGMD like muscular dystrophies, in cases showing: absence of dysferlin protein by the monocyte assay and/or a typical dysferlinopathy phenotype, with medium to high predictive scores using the ALDA tool. Results: Out of the 125 patients screened by NGS, 96 were confirmed with two dysferlin variants, of which 84 were homozygous. Single dysferlin pathogenic variants were seen in 4 patients, whereas 25 showed no variants in the dysferlin gene. Conclusion: In this study, 98.2% of patients with absence of the dysferlin protein showed one or more variants in the dysferlin gene and hence has a high predictive significance in diagnosing dysferlinopathies. However, collection of blood samples from all over India for protein analysis is expensive. Our analysis shows that the use of the “ALDA tool” could be a cost-effective alternative method. Identification of dysferlin pathogenic variants by NGS is the ultimate method for diagnosing dysferlinopathies though follow-up with the monocyte assay can be useful to understand the phenotype in relation to the dysferlin protein expression and also be a useful biomarker for future clinical trials. Neurological complications are frequently recognized with weight reduction surgeries for morbid obesity. 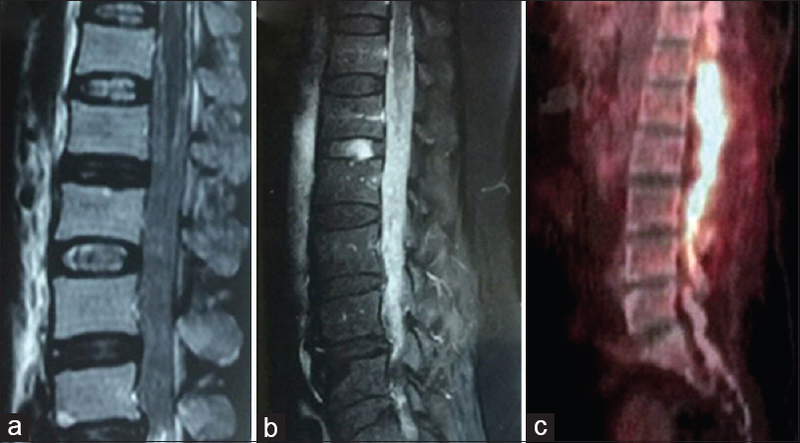 The spectrum of peripheral neuropathies complicating the weight loss surgery is wide, and among them, the acute axonal peripheral neuropathy resembling Guillain-Barre syndrome is rare and only less than a dozen cases are reported. We present three cases, which after bariatric surgery developed acute polyneuropathy that rapidly progressed over 4 weeks from the onset. All patients responded to aggressive parenteral Vitamin B1 and B12 replacement therapy. These cases highlight the fact that bariatric surgery although is a promising option to treat morbid obesity; it is certainly not devoid of potential neurological complications due to micronutrient deficiencies. Delay in the diagnosis of acute polyneuropathy may worsen its long-term sequelae. A multidisciplinary team management with careful nutritional monitoring at regular interval is crucial in all patients for early recognition and intervention to avoid these complications after bariatric surgery. Cerebral air embolism (CAE) is a potentially fatal iatrogenic complication related to common procedures including central venous catheter (CVC) removal. We report an interesting case of CAE related to CVC removal that was further complicated with status epilepticus. Neuroimaging of CAE and status epilepticus could pose diagnostic dilemmas and require consideration of wide diagnostic differentials. 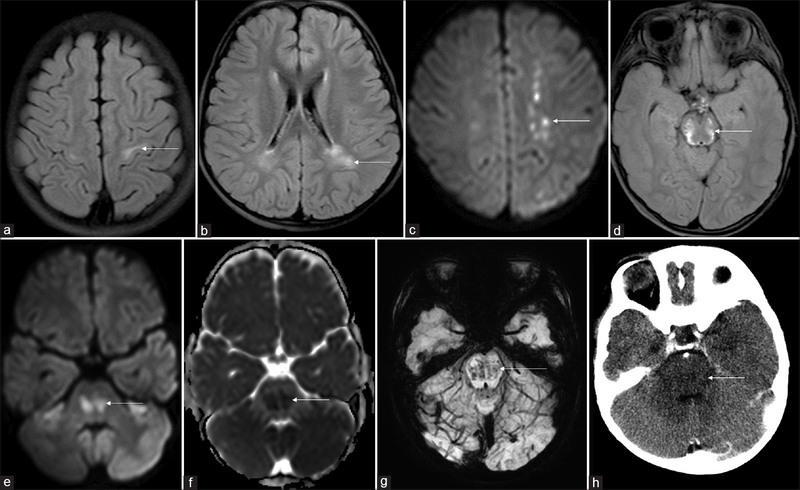 We discuss the clinical presentation, mechanism, and diagnostic approach, especially neuroimaging to differentiate various etiologies in CAE patients. 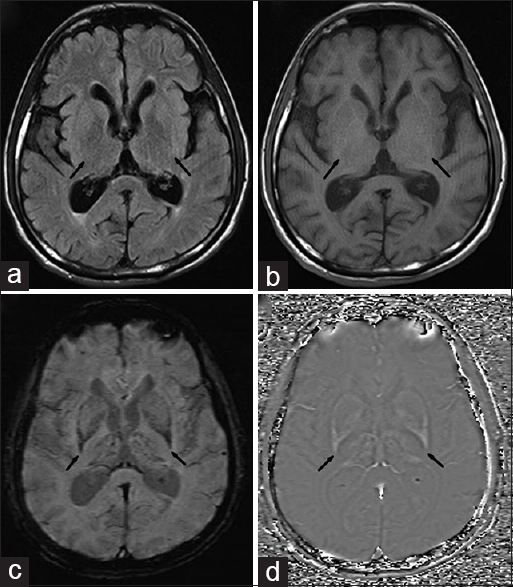 A young child with catastrophic neurological illness diagnosed as a rare variant of acute demyelinating encephalomyelitis (ADEM). She succumbed to her illness despite of aggressive and appropriate management. Malignant demyelinating encephalomyelitis should be considered in children who are refractory to the treatment of ADEM. Objectives: Writer's cramp is a focal dystonia producing abnormal postures during selective motor activities. Thalamotomy or globus pallidus internus deep brain stimulation (GPi DBS) has been used as a surgical treatment in patients not responding to medical treatment. Materials and Methods: Eight patients (all men, age 16–47 years) with refractory focal hand dystonia underwent either ventrooralis (Vo) thalamotomy (seven patients) or GPi DBS (one patient) using stereotactic techniques. Preoperative video recordings, Writing movment score for dystonic posture and latency of dystonia (WMS), and symptom severity scores (SSSs) were evaluated at baseline and latest follow-up ranging from 1 to 4 years. Results: All patients had difficulty in performing their most common tasks. The duration of symptoms ranged from 6 months to 12 years. All patients obtained immediate postoperative relief from the dystonic symptoms, and the effect was sustained during the follow-up period. The WMS (range 0–28) improved from a mean of 14.5 before surgery to 2, whereas the SSS (maximum 43 and minimum 10) improved from a mean of 15.3 before surgery to 2 at the last follow-up. There were no surgical complications, morbidity, or mortality. Conclusion: Vo thalamotomy or GPi DBS offers successful symptom relief in patients with task-specific dystonia.